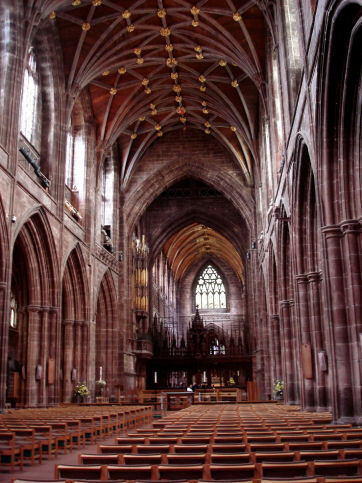 Chester Cathedral, a red sandstone, Grade I listed building, has been modified many times in the course of its long history. The site upon which it stands has been used for Christian worship since Roman times. All the major styles of English medieval architecture, from Norman to Perpendicular are represented in the present building. The cathedral and monastic buildings were extensively restored during the nineteenth century amidst some controversy, and a free-standing bell-tower was added in the twentieth century. A Christian basilica may have occupied the site of the present cathedral in the late Roman era, legend relates that this building was dedicated to St Paul and Saint Peter. 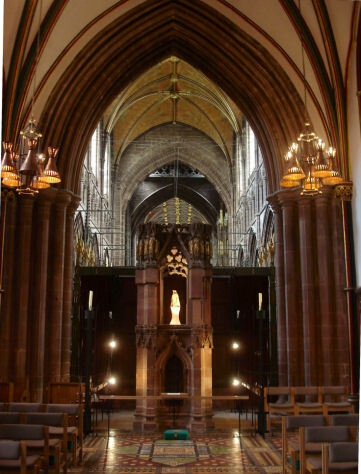 The Anglo-Saxon St Werburgh's remains were brought to Chester in the tenth century, and in 907 AD her shrine was placed inside the church. Werburgh (died 690 AD), the daughter of Wulfhere, King of Mercia, and grand-daughter of Penda of Mercia, was formerly buried at Hanbury in Staffordshire. 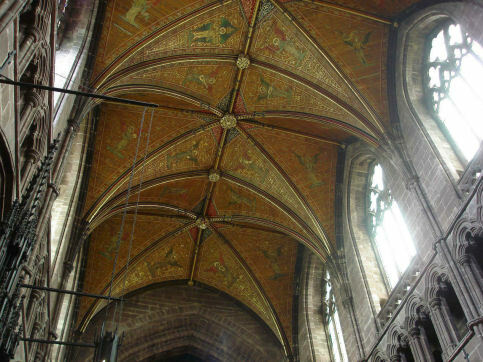 When the mortal remains of St Werburgh were removed to Chester, to protect them from Viking attacks, they were placed into a casket and in around 1340, were housed in an ornate carved shrine. 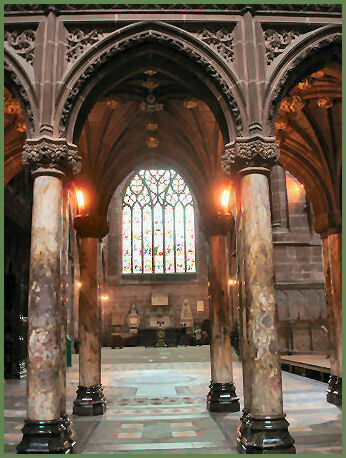 The thirteenth century Lady Chapel in the cathedral still contains the stone shrine of Saint Werburgh, which was used to contain her relics. The red sandstone shrine has a base pierced with deep niches. The upper part takes the form of a miniature chapel containing statuettes. The shrine was dismantled during the Dissolution of the Monasteries but some of the parts were found during the restoration of the cathedral in 1873 and the shrine was reassembled in 1888 by Blomfield. A carving of St Werburgh by Joseph Pyrz was added in 1993. Also in the chapel are a sedilia and a piscina are also housed in the chapel. It is thought that Æthelfleda, Lady of Mercia and the daughter of King Alfred the Great, turned the church into a college of secular canons, and that it was given a charter by King Edgar in 968. The abbey was restored in 1057 by Leofric, Earl of Mercia and Lady Godiva. No known trace of this abbey remains to the present day. Following the Norman Conquest, in 1093 a Benedictine monastery was established on the site by Hugh Lupus, 'the Wolf', Earl of Chester, and Ermetrude, his wife, transformed the building into a grand Benedictine monastery, assisted by Anselm, who later became Archbishop of Canterbury. The earliest surviving parts of the present structure date from that time. The style of the church was Romanesque, in imitation of the Roman building style, with round headed arches and solid masonry. Small trace of the tenth century building has been discovered, with the exception of some Saxon masonry found during excavation of the nave carried out in 1997, there remains, however, much evidence of the monastery of 1093. This work may be seen in the northwest tower, the north transept and in remaining parts of the monastic buildings. The first part of the cloisters to be built was the south side followed by the west, north and east sides. The final part to be constructed was the Chapter House, completed in about 1250 and, by that time, the architectural style had changed to the Gothic, with its characteristic pointed arches and ribbed ceilings.The abbey church, beginning with the Lady Chapel at the eastern end, was extensively rebuilt in Gothic style during the thirteenth and fourteenth centuries. The superbly carved woodwork in the quire dates from 1380. The Baltic oak stalls are carved into misericords, canopies and benches. The ends of the benches are worked into different figures, and close observation will reveal faces, hounds, biblical representations, angels and dragons. By the nineteenth century, the building was greatly in need of repair, major restoration took place from 1868 to 1876 under George Gilbert Scott when four small towers were added to the top of the central tower, further work continued into the early twentieth century. The cloisters were restored in the twentieth century, its stained glass windows contain the images of 130 saints. The cloister garth contains a modern sculpture entitled The water of life by Stephen Broadbent. 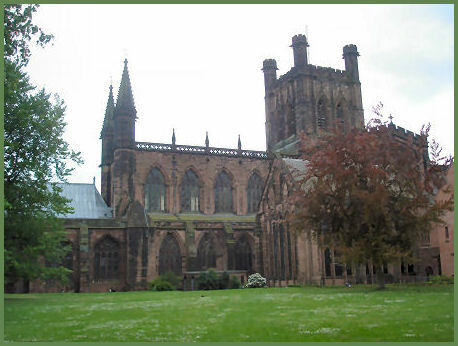 In 1973-75 a detached belfry designed by George Pace was erected in the grounds of the cathedral. 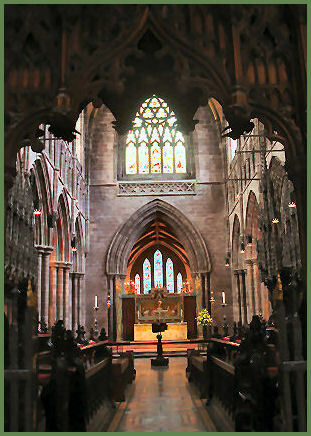 The ornate choir stalls date from around 1380. They have high, spiked, closely set canopies, with crocketed arches and spirelets. The stall ends have poppyheads and are rich with figurative carving. The stalls include 48 misericords, all but five of which are original. The magnificent Creation Window at the west end of the Refectory was designed by Rosalind Grimshaw and installed in 2001, it illustrates the Genesis account of the six days of Creation in the upper lights, with a contemporary interpretation of each image below. The Cathedral has its own shop and audiotour available to visitors helps unravel some of the cathedral's story. Westminster Abbey - founded by the Saxon king, Edward the Confessor and consecrated in 1065.